The best chess city in the World? Moscow, surely? At least that would be the first choice of many players and chess fans from around the world. Of course this is based upon the dominance of world chess by the USSR/Russia in the 20th century, but clearly the chess environment in Moscow must have something to do with it. Other choices? New York with its famous clubs (Marshall and Manhattan), Budapest due to the First Saturday events, or even Reykjavik, based on the number of GM's, the 1972 Fischer - Spassky match, and the fantastic Reykjavik Open. Well what about Chennai? The home city of former World Champion Viswanathan Anand claims it has the most number of FIDE rated players in the world. And to back this up, they are holding a tournament with 1205 players. Not that special, until you realise that it is an Under 1600 event, and there are still 724 rated players taking part. Obviously it is an issue of quality over quantity, but if they can get those sort of numbers for a Under 1600 tournament, what would happen if they decided to hold an open? The 2015 ACT Blitz Championship is on Wednesday 4th February at the ANU Chess Club, Asian Studies Building, Ellery Crescent, ANU. The tournament begins at 7:45 pm, with registrations from 7:30pm. The event is open to all ACTCA Members. This is the traditional start of the chess year tournament for chess in Canberra, although a couple of clubs have 'jumped the gun' in recent years. It is a serious tournament for a few players, but an opportunity to play chess with friends for most. The following week the ANU Chess Club will be holding the ANU Masters and for the first time, an ANU Challengers. Both tournaments will be FIDE Rated, which I believe is a first for a chess club in the ACT (the FIDE rating of club events that is). If this proves popular the club will look at FIDE rating other events throughout the year. One of the attractive features of chess is the size of the board. 8x8 is the perfect size as far as I'm concerned, for two main reasons. Firstly, a bigger board would tip the knight versus bishop battle in favour of the bishop, rather than the balanced battle we have now. The second is that the size seems to allow us to visualise future moves, which might be more difficult if the board grew larger. Of course not all of us can do this with a high degree of accuracy. Calculating on an open board (ie lots of open lines) is something I find fraught with difficulty, especially when trying to checkmate an opponents king. Having an enemy king surrounded by pieces often makes it easier to find the mate, while too many escape squares can be a nightmare. The 2015 Gibraltar Masters begins this evening, and once again it has attracted a massive field from around the world. The top 56 seeds of the Masters are all GM's, headed by Topalov, Nakamura and Svidler. The tournament has even seemed to bring out some names from the past, including GM James Tarjan (US Champ in 1973) and IM Nigel Povah (who to be fair still plays league chess in the UK). One notable omission is Australian players, as I have not been able to find anyone in the entry lists with AUS after their name. The top section has 253 players, while the subsidiary events have all attracted sizeable fields. The event really is a chess festival, with simuls, master classes, and team blitz events all part of the occasion. There is of course live coverage from the event, but it is not restricted to the master section. The Challengers event (held in the morning), is also featured on the live boards, so you can get two games for the price of one. If you are too far away from Gibraltar to drop in for the day (as I am), you can follow all the action at http://www.gibraltarchesscongress.com Each round starts at 1am (Canberra time), except the last, which starts 4 hours earlier. "It was the best of times, it was the blurst of times" is the kind of output you get if you sit an infinite number of monkeys in front of an infinite number of typewriters. This of course a well known thought experiment about whether such a scheme could produce the works of Shakespeare. An analogous question is whether such a system could produce the worlds best ever game of chess. These days such an experiment does not even require monkey's, as a computer can just as easily come up with random moves. I've stumbled across a few such programs, including one that is used a demo for chessboard.js If you go to http://chessboardjs.com/examples/5002 you can watch a game where the moves are chosen at random from the set of legal moves in any position. Yi Liu is the new Australian Junior Champion, after finishing the Under 18 section with 8/9. He went through the tournament undefeated, conceding draws to 2nd seed Pengy Chen and 3rd seed Max Chew Lee, while beating everyone else. Despite going into the final round with the title already confirmed, he still played a very sharp game against Chew Lee, the game ending with a repetition. Pengyu Chen finished second on an undefeated 7/9, but conceded too may early draws to challenge for first. The best local player was Michael Kethro who finished in outright 3rd with 6/9. Patrick Gong was the winner of a competitive Under 16 event, needing 8.5/9 just to stay half a point ahead of Tom Maguire who chased him all the way to the finish. Kristine Quek hung on to win the Under 18 Girls title, after stumbling in the 2nd last round. Her last round win kept her half a point ahead of Denise Lim who also finished the tournament with a win. The Under 14 Girls event was won by Cassandra Lim, who only dropped half a point on her way to 8.5/9. The Under 14 Open saw another 8.5/9 winner, in this case Haran Salasan, whose round 3 win over Ray Yang turned out to be the deciding game of the tournament. The Under 12 event was the only tournament requiring a playoff, with Matthew Clarke and Jason Wang tied on 7.5/9. They drew the 15m playoof games 1-1, and the 5m playoff games with the same score. In the final 'Armageddon' game, Ray Yanf (White) knocked back a cheeky draw offer from Clarke to win the game, and the title. Full results from the tournament can be found at www.ajcc.org.au, along with photos and games from the event. Although the organisers (including myself) are totally exhausted from running the 9 day championship, we hope to have more pictures, and game scores posted to the website in the next few days. In a news story replete with chess puns, a dispute between two English chessplayers over a trip to a chess tournament is in the headlines. At stake is a 160 pound loan/bet between Geoffrey Bishop and Russell Goodfellow after the pair travelled to the 2008 Gibraltar Open. Bishop claimed he loaned Goodfellow the money, which has not been repaid, while Goodfellow claims he won the money in a bet over time zones. In the end the judge threw the whole thing out of court, deciding that there was not enough evidence to decide who was telling the truth, and that the case was "impossible to continue". My favourite bit of the article was at the end where Bishop said the results were fairly even between the two, and that while Goodfellow had won their last game, he had "smashed him" the game before. Round 7 of the 2015 Australian Juniors saw an interesting game between Harry Press and Fred Litchfield. Both are local junior players, and both play at the ANU Chess Club, normally battling it out for first place in many of the club events. So it is expected that they are familiar with both the others opening choices, and style, but even then there are little surprises to be had. While Litchfield chose his usual French Defence, he avoided the offbeat 3. ... Nc6 line he tried earlier in the event. Press tried the Alekhine-Chatard Gambit, but Litchfield played it safe and declined the offer. However Press wasn't going to waste his h pawn, and after a speculative sacrifice on h7, used it as a battering ram against the Black king. 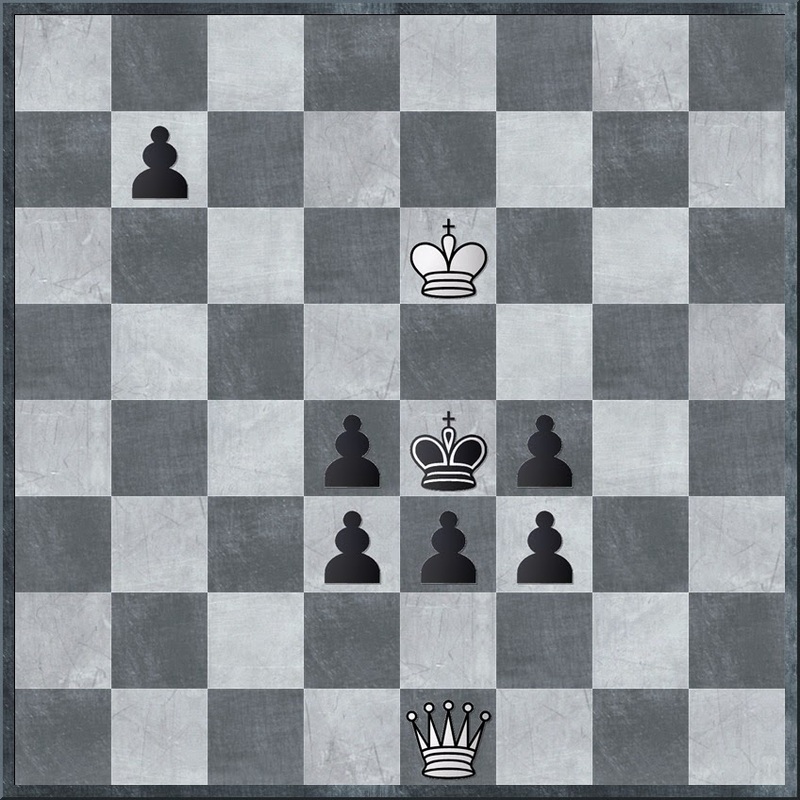 In the post-mortem it was clear that black did have a better defence (Ra7 etc), but a combination of a shortage of time, and a difficult position, all worked in White's favour. I'm pretty sure if I could play this game against Magnus Carlsen (or anyone rated above 2200) I would not think it was 'nonsense'. But if you are the worlds number 1 player, and trying for a 7th win in a row against the worlds top players, you are probably entitled to another opinion. Looking through some of the games from the current Australian Junior Championship, I came across a variation on a well known theme. The finish to the following game borrows heavily from the Blackburne 'Shilling Gambit', which begins with 1.e4 e5 2.Nf3 Nc6 3.Bc4 Nd4?! In this case it starts off as a Two Knights, Fritz Variation, before veering into familiar territory. Given this seems to be a more modern form of Blackburne's Gambit, it is only fair that the value of the opening is updated as well. Based on various estimates I have collected, a Shilling from around 1870 is worth about $3 in today's money. Unfortunately for young Piet, he may only get to pocket the original 20c though, as he seems to be the 14th player to win with these exact moves. Today was supposed to be a 'rest' day in the 2015 Australian Junior Championship. This did not stop over 110 players taking part in the Australian Junior Lightning Championship, or around 60 players taking part in the Australian Junior Problem Solving championship. The latter involved sitting a 2 hour 'exam' paper consisting of 15 problems/studies. It was also open to non-juniors, so I'd thought I would give it a go myself. Even though I took the full two hours, I did not manage to complete the whole test, missing one question entirely, and not providing full answers on a couple of other questions. I'm pretty sure my score won't qualify me for the next World Solving Championships, but it was still a worthwhile exercise. Here is an example of one of the questions from the paper (the first question actually). It is pretty simply to solve, with White to play and checkmate in 2 moves. They got harder after this. After a shaky start Magnus Carlsen has exploded at the 2015 Tata Steel tournament, winning 5 games in a row to lead the field with 6/8. Probably his most significant win was against Fabiano Caruana, in round 6. After Caruana's stellar performance in the 2014 Sinquefeld Cup, the Carlsen - Caruana rivalry became well established, but with this latest victory, Carlsen can claim to hold the edge. In the Challengers event, young Australian IM Ari Dale is having the opposite experience to Carlsen, with a run of 5 losses. Nonetheless, the strength of this event is so great (compared to Dale's rating), that 1.5/8 still has him gaining rating points. So far the 2015 Australian Junior Championship is running pretty smoothly, and based on the feedback I've seen, everyone seems happy with how it is going. Today was the only double round day for the Under 18 and Under 16 tournaments, but even then it wasn't that taxing on either the players, or organisers. Given the small size of the Under 18 section (14 players), the important match ups are starting early in this event. Top seed Yi Liu played Fred Litchfield (4th seed) in the morning, and Michael Kethro (6th seed) in the afternoon. He managed to beat both players, and kept up his policy of sacrificing something in every game. Pengyu Chen and Willis Lo are tied for second, after they drew an up and down game in the third round. The Under 16 Open is also sorting itself out, with Tom Maguire leading with 3/3. In second place are Rebecca Strickland, David Cannon, and Patrick Gong. Top seed Sean Gu suffered an accident in round 2, dropping a Queen to a tactic against Strickland, and is in the group of players on 2. The Under 10, Under 8 and Under10/8 Girls are already two thirds of the way through their 9 rounds. Dashiell Young leads the Under 10 Open with 5.5/6, but there is still a sizable group of players close behind. Jason Yan leads with 5.5/6 in the Under 8, and having played a couple of players just behind him is favourite to win the competition. In the Under 10/8 Girls Jennifer Zhang is on a perfect 6/6, 1.5 points ahead of second place. Having already played most of the other leaders, she should also finish this event in 1st place. The first day of the 2015 Australian Junior Championships was both a hectic, and rewarding, exercise. Five sections started today, Under 18, Under 16, Under 10 and Under 8 Open's, and the Under 10/8 Girls. The events all got off to a good start (with minimal crying in the younger age groups), and everything ran on schedule. Canberra Grammar School is the venue, and so far has been an excellent facility. The playing halls are quite spacious, and there are analysis areas for the plethora of chess coaches that have descended on the tournament. The school has opened its canteen for the tournament, and with plenty of space, the players have enough to keep them occupied between rounds. The older age groups played their first round today, while the younger sections got in 3 rounds (with a 60m+10s time control). Each event is 9 rounds, so the younger players only have 2 more days to play. The main event is the Under 18 section, and today's round went according to script (ie top half beat bottom half). Nonetheless there were some interesting games, with board 1 and board 2 producing attractive finishes. With a small field of 14 players, and the rating spread between top and middle not that great, there should be tough games in almost every round. Full results from the event, as well as all the bells and whistles, can be found at www.ajcc.org.au. Live coverage of the top boards from the Under 18 and 16's is also available from this page. Back from a long day setting up for the Australian Junior Championships, I collapsed on the lounge, turned on the TV, and began to watch the latest version of "The Three Musketeers". Very quickly a chess scene popped up, but sadly it was a 'bad' chess scene. Cardinal Richelieu is playing the King of France and announces 'Check'. The King complains about the relative strength of the pieces, and Richelieu then suggests the King might castle in the position. Of course the movie is set in a time when the Laws of Chess were slightly different, (and the movies itself played a little loose with historical facts), but I'm almost certain you still could not castle out of check. To conclude the scene the King ignores the advice anyway, plays another move, and is promptly checkmated, which I assume was intended as a lesson on listening to people smarter than you. The 2015 Australian Junior Championships begins this Saturday in Canberra. The tournament was last held in Canberra in 2006, and attracted a then record field of 220 players. This years event has exceeded that, with around 260 players entered so far. As is the trend of recent times, the bulk of the entries is in the Under 12 and Under 10 sections, although numbers have been pretty good throughout. I am involved in this years event as an arbiter (nb: a paid position), having previously been involved as an organiser in 1995. My participation extends back even further than that, finishing with 2.5/13 way back in 1983, when the event was just a single tournament (and attracted a field of 31 players). The tournament website is http://www.ajcc.org.au/ and will provide coverage of the tournament. There will be live games from the event (hopefully 8 boards) as well as online bulletins and media content. I am doing double duty as the on site webmaster, so of there is any info you need, just yell. IM Ari Dale continues to hold his own in the Tata Steel Challengers event, drawing his first 3 games. In yesterdays round he faced Chinese GM Yi Wei, and despite being outrated by almost 400 points, he gave the Super GM quite a scare. Starting with 14.g4 Dale embarked on an ambitious kingside attack. This did involve the investment of some material, as well as a commitment to see the attack through to the end. On move 20 he sacrificed a knight to further expose the Black king, and after the Re3-h3 manoeuvre, Black had no way to escape a perpetual check. Sitting on 50% after 3 rounds, Dale has already done as much as most people expected him to do in the entire tournament. Importantly, he has also shown he isn't overawed by the occasion. He might find it a little tougher now that his opponents realise he isn't going to be a push over, but this may result in them playing more cautiously themselves. Tata Steel is the first top level GM event of 2015, and it is now underway at it's traditional home of Wijk aan Zee. Unlike similar events held throughout the year, the organisers don't just pack the event with top 10 players, but like to spread the field out a bit. Nonetheless, any tournament that includes Magnus Carlsen, Fabiano Caruana, Lev Aronian and Anish Giri can still be called pretty strong. Two rounds of the tournament have already been held, and it is Caruana who has jumped out to the lead, winning in both rounds. Carlsen, Giri and Aronian have all started with 2 draws, while Ivanchuk and Vachier-Lagrave are the only other players with a plus score. In the Challengers event, young Australian IM Ari Dale looks to face a formidable challenge, at least on paper. In the tournament by virtue of winning last years qualifying event, he will be outrated by over 200 points in almost every game he plays. However he has got off to a promising start, drawing his first two games to sit mid field. The rounds start at 11:30pm (Canberra time) and can be followed from the tournament website here. Chinese GM Hua Ni has completed a dominating performance in the 2015 Australian Open, scoring 10.5/11. Ni conceded a single draw to GM Rustam Khusnutdinov, and won all his other games. Apart from Khusnutdinov (who finished in a tie for 4th) he beat the next 6 highest placed players (on tie-break). The margin of victory was 2.5 points, with GM Murtas Kazhgaleyev and IM Max Illingworth sharing second place on 8/11. Apart from Ni streeting the field, the rest of the tournament was very competitive. A number of the top seeds found it tough going against the young Australian players. IM's Morris, Cheng and Ly all finished in a tie for 4th place (7.5/11) while FM Chris Wallis and FM Eugene Schon both score IM norms. Apart from deciding the Australian Open title, the tournament saw the 2015 Australian Women's Champion title go to WIM Heather Richards, who won her last round game to finish on 6/11. The win by Ni completes a trio of successful international events for Chinese GM's. GM Jun Zhao won the Hastings International with 8/9, while GM Xue Zhao won the 2015 New Zealand Open with the same score. All 3 players went through their events undefeated, conceding only 5 draws in a total of 29 games. Final standings for the 2015 Australian Open can be found here. Although the New Zealand Open fiisihed yesterday, the chess has ot stopped, with the New Zealand Rapidplay Championship on today and tomorrow. The Rapidplay attracted a field of 96 players which is very impressive given the Open has 115 players. (I did note that in Australia events like this would struggle to get 50% of the main field playing). I played a couple of games, in the role of the 'filler', making sure that everyone got a game. I finished on 1.5/2, with a half point bye in the first round, although I did play a (serious) friendly game against William Li in round 1, after his opponent failed to show (I lost after blundering a rook). I did win my second game against Prashant Mistry, who apart from his loss to me finished the day on 4/5, including wins over 2 (of the many) current New Zealand Champions. The whole day was quite enjoyable, with the Auckland weather a standout. Unfortunately my trip has come to an end, and I am up at 4am for a 7am flight back to Australia. However given the amount of travel I did last year (4 Australia to Europe round trips), the flight across the Tasman should be a bit of a doddle. I'll barely have time to catch up with Downton Abbey before the plane touches down in Sydney! GM Xue Zhao (CHN) has won the 2015 New Zealand Open with an impressive score of 8/9. In the final round she faced young Australian Karl Zelesco, who was only half a point behind her. In a winner take all game, Zhao ket the position under control before going ahead materially and collecting the full point. There was a 4 way tie for second place with GM's Klaus Bischoff, David Howell, Allen Rasmussen and CM Eu Wen Teh all winning their last round games to score 7/9. The title of New Zealand Champion was awarded to the highest placed New Zealand player and due to a combination of results (calculated by IM Anthony Kerr as having a 1.9% chance of actually occurring), there was a massive 9 way tie. The players (too numerous to mention) finished on 6/9, and can all add the title of 2015 New Zealand Champion to their resume (there is no tie-break for the NZ title). Curiously they 6/9 score left them out of the tournament prize list, so their was no monetary reward to go with the title. The full results from the event can be found at the tournament website (NB For those who only 8 New Zealanders on 6/9, Gordon Morrell is an NZ resident despite playing under a Canadian flag). I am heading off to New Zealand for a few days, in what may be my last chess related overseas trip for some time. I am attending a meeting of the Oceania Chess Confederation, and will catch the last day of the New Zealand Open while I am there. It also gives me an opportunity to check out the New Zealand Chess Centre, which is hosting both the tournament, and the meeting. I know reports on such meetings are terribly boring, so hopefully I will find some other chess related news to cover during my 4 days away. Looking for the new 'strongest' chess engine since the ignominious demise of Rybka? Well Komodo seems to be the new number 1, based on the results of the latest TCEC (Thoresen Chess Engine Competition). Komodo finished ahead of Houdini and Stockfish in the tournament, and now sits at the top of Computer Chess Rating List. Komodo was initially developed by the late Don Dailey, with the assistance of GM Larry Kaufman, and later on Mark Lefler. In the final of TCEC7, Komodo beat Stockfish 33.5-30.5 to regain the title it had lost to Stockfish in the previous event. The current commercial version of Komodo is available for $60 from the developers website. But if you want to give an earlier version a spin, Komodo 5.1 is available for free from the same place. If you are interested in finding out more about Komodo's win, and indeed a whole lot more about the current state of computer chess, then this blog post by Professor Ken Regan is definitely worth reading. And once you have read that, check out various other posts on that site on the topic of maths, chess, philosophy and various other topics. I was having a wander through the byways of the Internet when I came across an article on Bidding Chess. It seems to combine a couple of interests of mine (chess and game theory) as well as looking like a fun party game. The basics of bidding chess are as follows. Each player starts with 100 chips, which are used to bid for the right to move. Before each turn both players write down a bid for the move, and the highest bid wins (which means you can play more than 1 move in a row). As compensation the losing bidder receives the amount of chips bid by the winner. There is also an extra chip which is used to split ties. If you bid the extra chip it wins any ties (and is passed to your opponent, even if you win a non tied bid). If you don't use it, then you lose any ties (but keep the chip). Moves must be legal chess moves with the exception that the game ends when the king is captured (no checkmate). The interesting aspect of the game is determining how much a move is worth at any point. You need to balance the need to have a move with the size of your bankroll. Obviously having your opponent in check, while having the majority of chips is an automatic win, but reaching that position may be quite difficult. The inventors of the game are Jay Bhat and Sam Payne, and they have even written a paper on the game. It gives a complete set of rules plus an example of how the game works. There is even a brief discussion about the theory behind bidding games, for the more technical minded. Whenever a player starts an event with a run of wins, talk inevitably turns to Bobby Fischer, and visions of 100% . Fabiano Caruana's start in the 2014 Sinquefeld Cup was an example of this at the very highest level, while a more recent example was the start of GM Jun Zhao at the current Hastings International. He started the event with 6/6, leading to speculation that 9/9 was an achievable goal. But almost as soon as this talk began, it was shutdown as Zhao drew his round 7 game. The fact that he drew in round 7 shows one of the reason why 100% in any long tournament is incredibly difficult to achieve. The main goal of a tournament top seed is to win the event, and this does not require victory in every game. You simply need to score more points than the other players, and if this involves taking a couple of draws, then so be it. Sometimes a tournament will try and encourage players to strive for more via extra prizes (eg $64,000 bonus for 100% in the US Champs, or the Doeberl Cup fighting fund), but this has not resulted in a rash of 'perfect' tournaments. In fact for a lot of players the prospect of gaining or losing rating points seems to be the greater motivator in a lot of situations, as for a chess professional, this seems to be the'currency' they prefer to value. Across the Tasman, the 2015 New Zealand Open is also underway. Being held at the New Zealand Chess Centre in Devonport, the tournament has attracted a good field of local players, as well as some highly rated international visitors. In fact the field of 115 players is slightly larger than the Australian Open, although the New Zealand event is not running a minor event, like the Australian tournament. After four rounds first placed is shared between GM Klaus Bischoff (GER) and IM Russell Dive (NZL). Half a point back are a number of players, including GM David Howell (ENG) and Karl Zelesco (AUS). The event also doubles as the New Zealand Championship, with the highest placed New Zealand player winning the title. Today's win by Dive over many times champion IM Anthony Kerr was therefore doubly significant, as it keeps him in first place, and puts some distance between himself and local rivals. Further information from this tournament, including live broadcasts of the games, can be found at the tournament website. The 2015 Australian Open has begun, although it is still too early to point to an eventual winner. What is slightly more obvious is that the top seeds are in the main handling the early rounds fairly easily. While a couple of half points have been dropped here and there after 3 rounds, the top 9 seeds are yet to lose a game. Top seed Hua Ni would have found the first two rounds quite pleasant, winning his games in 14 and 25 moves, before being pushed all the way to move 34 before winning his third game. The tournament website is providing live coverage and results for the tournament, although it is following the popular trend of 'outsourcing' some of its information. The results are actually at chess-results.com while the live coverage seems to be going through chess24.com. However this does have its advantages, as the games have a comment feature enabled, allowing spectators to be a little more engaged with the action. The January 2014 FIDE Rating list contained the usual familiar facts (Carlsen number 1, the gap not really closing, juniors improving), but also at least 1 surprise. The spectacular jump of Parviz Gasimov, an Azerbaijan junior, from 1949 to 2517 in the space of three months, has resulted in some excitable commentary. While a number of people have questioned how this happened, the simple explanation is the new FIDE K factor of 40 for players who have played less than 30 games, or are under 18 and are rated below 2300. Gasimov seems to have simply timed his run well, reaching 2295 on the December 2014 rating list, before picking up another 220 points for the January list. While there seems to be a bit of 'something should be done' in the air, I personally do not think this is a defect in the system. One of the results that Gasimov achieved was a 12.5/15 in a tournament that was not particularly strong (a lot of 1900's and 2000's). But as he managed to beat almost all the players with that rating it is valid to say that he must be significantly stronger than they are. A similar outcome occurred a number of years back under the old Australian rating system (ELO with bonus points). Pat Halpin played a series of events in Queensland, and did very well (he scored 75%-80% IIRC). The fields were mainly around his own rating (2100) but as performed consistently well, his rating jumped to 2350, which mad him the 5th highest rated player in Australia. Despite fielding calls from concerned chess players (as I was the ACF Ratings Officer at the time), the system was not changed, and Halpin's rating soon dropped back to a level that other people found acceptable (and reflected his subsequent performances). I'm pretty sure the same thing will happen with Gasimov, although he may benefit from a few extra tournament invitations in the meantime. A strange story coming out of Wollongong concerning two chess players, a hunting knife, and a giant chess set. It appears the two players had a bit of a "history" going back a number of years, and it all boiled over at a giant chess set outside the Warrawong Shopping Centre. One player arrived at the board armed with a hunting knife, and the other player defended himself by using the large pieces to ward off his attacker. The dispute then continued on foot inside the shopping centre, before security guards intervened. It is not the first time that a chess board has been the scene of violence, with the famous Doeberl Cup incident a notable example. It isn't even the first time giant chess pieces have been involved either. A number of years back (maybe 20 or so) there was a dispute between some street chess players and a group of skateboarders in the centre of Canberra. The players objected to the skateboarders skating through the giant board in Garema place, and an argument occurred. At least one skateboard was thrown onto the roof of the old electricity substation, and some claret was spilled. The police were called and it even made the pages of the Canberra Times.